New book, Affinity Online, explores how online practices and networks bridge the divide between in-school and out-of-school learning. Ito et al describe the ways in which online affinity networks can be conducive to Connected Learning, explicating an updated model of Connected Learning in the process. This book is the output of the Leveling Up study; it is a collaboratively authored text identifying themes that were shared across multiple ethnographic studies in a variety of online affinity network contexts. Connected learning “both describes a form of meaningful and opportunity-enhancing learning and guides design and policies that expand access to this form of learning” (p. 3). It “is centered on young people’s interest-driven learning and is agnostic as to the types of relationships and institutions that can support this learning” (p. 3). How do online affinity networks connect to educational, career, and civic opportunity? While educational technology (“edtech”), and especially specific edtech tools, have both proponents and detractors, their approaches fail to consider that “Technologies and techniques…. Take on different characteristics depending on the cultural and social settings they are embedded in” (p. 6). Without attention to the cultural and social environment, new technologies “tend to amplify existing inequity” (p. 6). The Macarthur Foundation’s Digital Media and Learning Initiative funded research conducted by, among others, members of the Connected Learning Research Network. One of these projects was the Digital Youth Project. Fieldwork for this project was undertaken in 2006 – 2007, when “teens were flocking to MySpace… YouTube was just taking off… before the mobile internet and texting had taken hold in the United States” (p. 8). The output of that project was the book Hanging Out, Messing Around, and Geeking Out: Kids Living and Learning with New Media (Ito et al 2009). The model described in that book was designed to describe how children and teens interact with new media, but “was not designed to directly inform educational practice or design” (p. 9). Affinity Online is an output of the Leveling Up project, another project of the CLRN. Contrasting with HOMAGO, Affinity Online is explicitly designed to inform “the design and deployment of learning technologies and related programs” (p. 10). The project came about because “…large-scale adoption of new media created an imperative to investigate the potential connections between young people’s online activities and meaningful opportunities in education, civic institutions, and careers” (p. 10). This text provides a “cross-case analysis of in-depth qualitative research in networked settings” (p. 12), specifically “a variety of affinity networks that make use of online spaces” (p. 13). Data collection methods include “questionnaires, surveys, semistructured interviews, observation, and content analysis of media, profiles, videos, and other online artifacts” (p. 13). Networks were chosen by seeking out “examples of practices already existing in communities that can be spread and scaled to address systemic problems” (p. 14), an approach from the public health field called “positive deviance” (Pascale, Sternin, and Sternin 2010). This idea of network-building as opposed to pathway-traversing is similar to the contrast Martin (2012) draws between traditional, linear models of information literacy and her new, more networked model of information literacy. It also has implications for people who are trying to identify pathways to connected learning, such as Bender & Peppler (2019). Should people asking questions like Bender & Peppler’s be investigating networks rather than pathways? KEY FINDING: Online affinity networks rarely overlap with school or local networks or career networks. “When we consider the resources and supports that young people need to connect their interests to their opportunity, equity becomes of critical concern.” (p. 168) Youth need programs and mentors with social capital to broker connections; if brokering is treated as a market-driven process, this exacerbates inequity. Barriers to “having a shared understanding and public agenda for how the adult world can harness online affinity networks for educational opportunity and equity” (p. 171) include the Digital Culture Generation Gap and Compartmentalized Social Networks. Re: the Digital Culture Generation gap – “lack of understanding and visibility around what digital youth culture is about” (p. 172) and “cultural values and negative stereotypes” – e.g. gaming and fandom in particular are stereotyped as addicitvie and frivolous, respectively. Re: Compartmentalized Social Netowrks – “online affinity networks can support bonding social captiial, but they have few avenues for bridging social capital between onlien relationships and local ones, limiting connections to academic, career, and civic opportunity” (p. 173). “In learning environments that are less interest-driven [esp. Schools], it is more challenging to develop this sense of shared community values, culture, and purpose” (p. 176). Schools tend to foster this more in extracurriculars and electives. These activities offer a potential site of connection between online affinity networks and local networks. An examination of young people's everyday new media practices—including video-game playing, text-messaging, digital media production, and social media use. Ito and colleagues take an ecological approach to youth new media practice, looking for both commonalities and diversity, seeking to describe youth’s practices and how they affect “the dynamics of youth-adult negotiation over literacy, learning, and authoritative knowledge” (p. 2). They report on “a three-year ethnographic investigation of youth new media practice” (p. 2). They consider how these practices fit into social and cultural worlds and how they are meaningful in youth’s everyday lives. They take a sociology-of-youth-and-childhood approach, considering youth as social actors who can impact culture. Youth are both consumers and producers. The practices Ito and colleagues examine occur in social or recreational contexts rather than instructional contexts. Ito and colleagues analyze their data around four concepts: “genres of participation,” “networked publics,” “peer-based learning,” and “new media literacy” (p. 14). Genres of participation include friendship-driven participation (“hanging out”) and interest-driven participation (“geeking out”). A third genre, “messing around,” bridges the other two. Youth transition between the three genres. “Networked publics” captures the socially- and technologically-mediated nature of youth spaces. Peer-based learning is reciprocal and not hierarchical, occuring in spaces where adults do not have authority. Ito and colleagues describe but do not prescribe new media literacies. Having described youth practices, Ito and colleagues offer “potential sites of adult participation and intervention in youth practices” (p. 341). They suggest that adults and youth need to develop “a shared sense of what counts as valuable learning and positive sociability” (p. 343) and share equal contributions of interest and expertise. Ito and colleagues point out that educators are often cut off from adult leaders in interest groups, and that it would benefit youth if these two groups coordinated their efforts. They emphasize that educators must provide youth with the tools they need to participate in these practices, and recognize that this may require access to content that is more social or recreational than “serious.” Learning environments and pedagogical interventions should be designed with the social, technical, and cultural support youth need in mind. “In many ways, the crucial ingredient in youth engagement and successful adult intervention in these spaces seems to be a stance of mutual respect and reciprocity, where youth expertise, autonomy, and initiative are valued” (p. 350). Ito and colleagues conclude by imagining the goal of education to be not preparing youth for jobs and careers, but instead guiding them toward participation in public life by sharing the responsibility for education between schools and a “distributed network of people and institutions” (p. 352). Patti's Smith's exquisite prose is generously illustrated in this full-color edition of her classic coming-of-age memoir, Just Kids. New York locations vividly come to life where, as young artists, Patti Smith and Robert Mapplethorpe met and fell in love: a first apartment in Brooklyn, Times Square with John and Yoko's iconic billboard, Max's Kansas City, or the gritty fire escape of the Hotel Chelsea. Kumasi, K. (2014). Connected Learning: Linking Academics, Popular Culture, and Digital Literacy in a Young Urban Scholars Book Club. Teacher Librarian, 41(3), 8–15. Kumasi describes a Young Urban Scholars Book Club as a model connected learning program designed to meet the needs of youth who could “become disconnected from school and life if the right kind of learning opportunities are not available to them” (p. 8). Learning is most effective when intrinsically motivated through personal interest, and situated in a supportive socio-cultural context. This paper reports on findings from a study that explored implications for design of interactive learning environments through 18 months of ethnographic observations of people’s interactions at “Hack The Evening” (HTE). HTE is a meetup group initiated at the State Library of Queensland in Brisbane, Australia, and dedicated to provide visitors with opportunities for connected learning in relation to hacking, making and do-it-yourself technology. The results provide insights into factors that contributed to HTE as a social, interactive and participatory environment for learning – knowledge is created and co-created through uncoordinated interactions among participants that come from a diversity of backgrounds, skills and areas of expertise. The insights also reveal challenges and barriers that the HTE group faced in regards to connected learning. Four dimensions of design opportunities are presented to overcome those challenges and barriers towards improving connected learning in library buildings and other free-choice learning environments that seek to embody a more interactive and participatory culture among their users. The insights are relevant for librarians as well as designers, managers and decision makers of other interactive and free-choice learning environments. Bilandzic, M. (2013). Connected learning in the library as a product of hacking, making, social diversity and messiness. Interactive Learning Environments, 24(1), 158–177. What factors facilitate the connected learning experience of members within the group? How does the public library as a location for the meetup group affect the participants’ learnign experience? Two factors contributed to HTE’s success as a connected learning environment: uncoordinated interactions between participants and diversity in participants’ backgrounds, skills, and expertise. Designing environments that facilitate these interactions through an “open, uncoordinated and flexible meeting agenda” (p. 24 in author’s copy; consult published version for final page number) and invite diverse participants in can create space for connected learning to take place. Supporting informal socialisation and hangouts between participants inside as well as outside the learning space premises and opening hours (p. 25 in author’s copy; consult published version for final page number). If you want to check out the video or notes for my keynote presentation at today’s IndieWebCamp New Haven, you can find them here! I talked about Connected Learning, the IndieWeb, the great fandom Tumblr diaspora, and libraries! Larson, K., Ito, M., Brown, E., Hawkins, M., Pinkard, N., & Sebring, P. (2013). Safe Space and Shared Interests: YOUmedia Chicago as a Laboratory for Connected Learning. Irvine, CA: Digital Media and Learning Research Hub. Larson et al document the YOUmedia Learning Lab at the Chicago Public Library’s downtown Harold Washington Library center. The lab is designed to support HOMAGO. Ito and Martin provide an overview of how libraries are “uniquely situated to become a nexus of connected learning because their mission centers on personalized and interest-driven learning” and they are “well-positioned to not only connect formal and informal learning but also to do this for the populations that are most marginalized in terms of traditional academic programs and indicators” (p. 30). This report is a synthesis of ongoing research, design, and implementation of an approach to education called “connected learning.” It advocates for broadened access to learning that is socially embedded, interest-driven, and oriented toward educational, economic, or political opportunity. Connected learning is realized when a young person is able to pursue a personal interest or passion with the support of friends and caring adults, and is in turn able to link this learning and interest to academic achievement, career success or civic engagement. This model is based on evidence that the most resilient, adaptive, and effective learning involves individual interest as well as social support to overcome adversity and provide recognition. The report investigates how we can use new media to foster the growth and sustenance of environments that support connected learning in a broad-based and equitable way. This report also offers a design and reform agenda, grounded in a rich understanding of child development and learning, to promote and test connected learning theories. Ito, M., Gutiérrez, K., Livingstone, S., Penuel, B., Rhodes, J., Salen, K., … Craig Watkins, S. (2013). Connected Learning: An Agenda for Research and Design. Irvine, CA: Digital Media and Learning Research Hub. Data is fundamental to the modern world. From economic development, to healthcare, to education and public policy, we rely on numbers to allocate resources and make crucial decisions. But because so much data fails to take into account gender, because it treats men as the default and women as atypical, bias and discrimination are baked into our systems. Making a note to myself to come back to this Austin Kleon blog post and write about it in relationship to connected parenting. 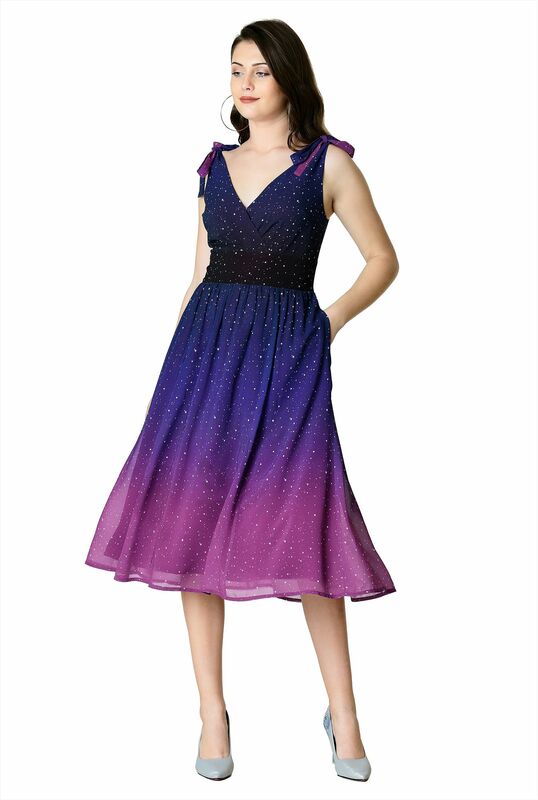 Our ombre star print georgette dress is designed to flatter and enhance with an angled pleat surplice bodice, banded empire waist and ruched pleat full skirt. I bought this dress & wore it to a wedding recently and basically I want this to be my whole aesthetic now.